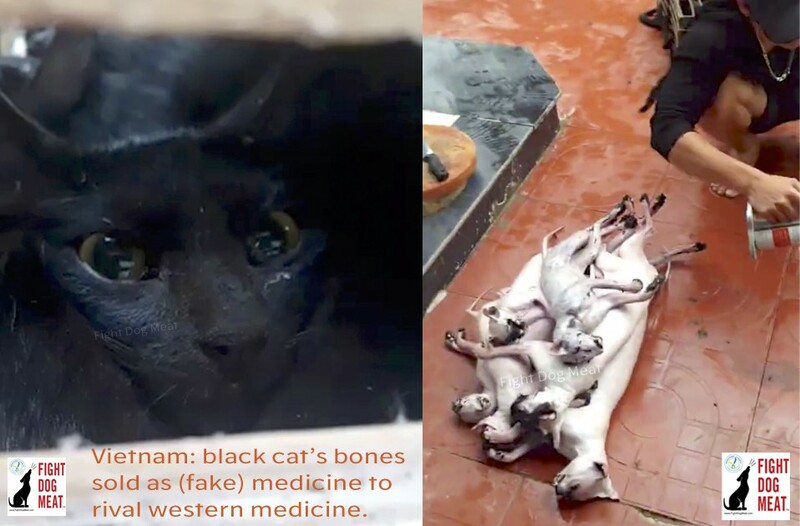 Black cats are hit on the head and boiled alive in Hanoi, and their bones sold as health tonic medicine to be drunk with alcohol. One of the companies shamelessly guarantees cures for serious illnesses and targets elderly people who are weak or in pain. Black cat bones are churned into a black paste and commercially marketed as medicine which they say rivals western and oriental medicines. Cat slaughterhouses employee teams of workers to slaughter and cook black cats to produce the paste. They also cook cat meat to order and they’re categorized as ‘Health and Beauty’ and recommend their product as birthday gifts. 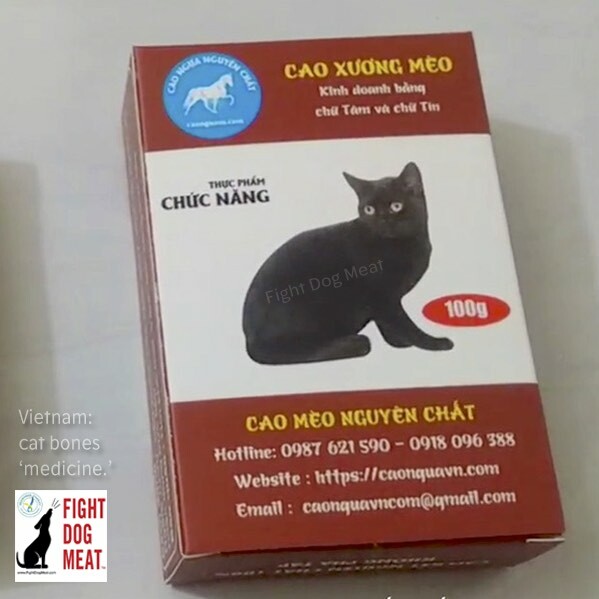 Another black cat bone business in Vietnam which commercially sells black cat’s bones as medicine. Fight Dog Meat: There is no scientific evidence to back up any of these outlandish claims! Fight Dog Meat works with animal rescue teams in Vietnam and many local animal lovers. Many Vietnamese rescuers do amazing work with next to nothing. They’re exhausted, broke and many end up suffering depression because of the never ending animal cruelty surrounding them every day. We’re helping them have a voice to bring in animal protection laws in their country. In conclusion, Fight Dog Meat is a Registered Charity helping animals and rescue teams in a number of dog and cat meat countries, including Vietnam. Please consider a small donation: https://fightdogmeat.com/donate/. Paypal: Donate@fightdogmeat.com. 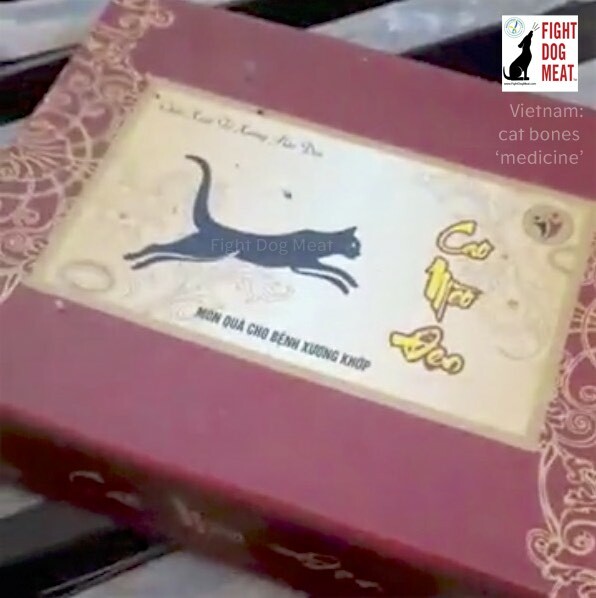 Account Name: Fight Dog Meat Ltd.
Founder.READ MORE: Inside A Vietnamese Cat Meat Market, With Quyen. BOYCOTT THE SICK EVIL PSYCHIATRIC SONS O BITCHS –VIETNAMIS !!! !DISGRACEFULL !!!! They really make you wonder how these sadistic and moronic tribes are able to inflict such cruelty on innocent animals. Wish someone or something could inflict such cruelty on them. Created by the devil. Sick practice with health beliefs that don’t exist. These people are crazy. These poor innocent cats don’t deserve that cruelty.